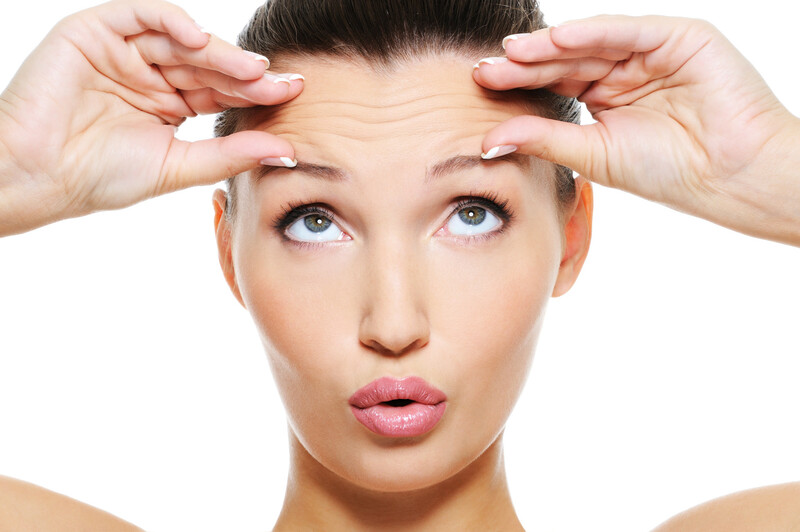 BOTOX® Cosmetic is a prescription medicine that is injected into muscles to relax them and eliminate dynamic lines of the upper part of the face; namely crow’s feet (lines on sides of eyes when one smiles), frown lines( also known as number 11 lines between the eyebrows) and the horizontal forehead lines. Also, botox can erase bunny lines(lines between nose and eyes), dimpled chin and vertical neck bands. In addition to the above common indications, botox can also be used to correct a gummy smile or make a square jaw more slender. It is also used to treat excessive underarm sweating (hyperhidrosis) and migraine. During your first consutation for facial wrinkles,Dr. Vrushali will evaluate your skin for static and dynamic lines, valleys and plateaus and all the problem areas will be identified.Then depending on the problem area, the client's expectations and choice, a suitable treatment, botox or filler or PRP or a non surgical face lift is suggested and its implications are discussed. If Botox is the treatments of choice, Dr.Vrushali will do a careful evaluation as to where to administer the injections and how many units. After the client completely understands the procedure, what results can be expected, post care, the client will be readied for the procedure with an anesthetic cream for half hour. Tiny injections of Botox will be administered directly into the target muscles. The client is given post procedure care and can get back to routine almost immediately. The client is ordinarily called after 2 weeks for a follow up or touch up, if necessary. Results begin to show from the 3rd day and complete results come in 7 - 14 days. The results last from 4 to 6 months. A lot creams are available in the market that claim to have a botox mimetic action. What needs to be understood is that Botox is injected directly into the muscle which is quite deep, even below the pad of fat below the skin. So a cream massaged onto the face will not reach the target muscle and cannot give a botox like result but only temporarily hydrates the skin and making the lines less apparent. A lot of people feel Botox is expensive. But people spend so much in buying fancy expensive branded antiaging creams that only temporarily plump up the lines. Whereas Botox is a very wise investment with a target oriented approach and cost effective too. It is very important to get your Botox done from a trained dermatologist. Dr. Vrushali has devised a list of 10 questions that one must ask their doctor before getting botoxed..
Are you a trained dermatologist for this job ? How much time does it take ? When will I see the result ? Will it give me a frozen look ? Will it get worse if I don’t repeat it ? What are the side effects ? What is the after care to be followed ? Where will botox not work ? What should be the gap between botox and other procedures like fillers, HIFU, RF, peels, dermaroller etc ?